Medtronic just published results from their ASPIRE study showing decreased time in hypoglycemia for patients using their new “low glucose suspend” feature. The new system will automatically and temporarily suspend insulin delivery if the patient’s glucose falls below a set threshold value. In this case, the threshold of <70 mg/dl was used. I know that there are a number of patients who use Medtronic pumps and Dexcom sensors because they find the Dexcom sensor more comfortable. This new feature requires use of both the Medtronic pump and Medtronic sensor in order to create the first step towards a closed-loop system. I wonder whether this new feature will convince at least a few patients to switch to using a Medtronic sensor. I’d be curious to hear comments from any patients who are in this situation and what your thoughts are. 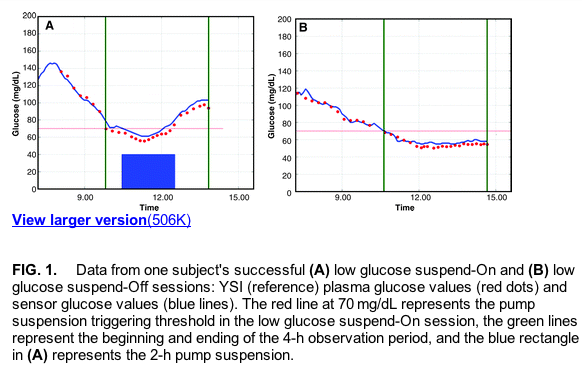 Graph below taken from the Diabetes Technology and Therapeutics publication showing glucose values from patients with and without the low glucose suspend feature.